We've got around 50 days to go before we get to meet our Baby #2, and it has me feeling all kinds of nostalgia. Nearly two years ago, I had the privilege and honor of delivering our firstborn child into this world. This morning I did some searching on my blog to relive it through the images, only to realize that I never actually featured Elias's birth story publicly, even though we had an amazing birth photographer. Why? Well, at the last minute, we had to use our 'Plan B' birth plan, and it disappointed me to the degree that even the images brought back sour feelings. 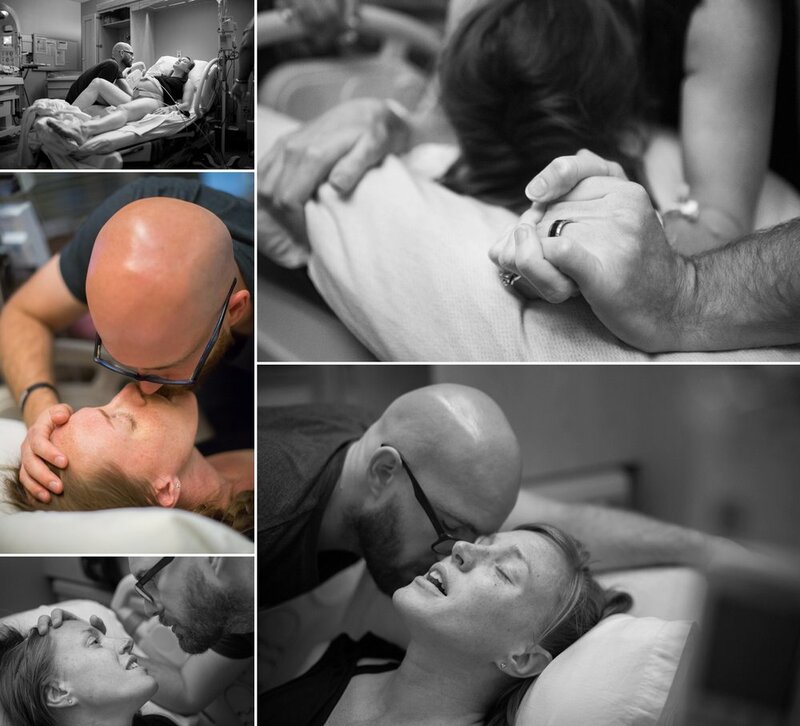 But, Elias's birth was still incredibly beautiful, so today, I’d like to be vulnerable and honest enough to share his birth story, along with some tasteful image highlights perfectly captured by Courtney Potter - The Birth Collective. Let me begin by saying that there is absolutely NOTHING wrong with delivering in the hospital, but for us, it just wasn’t our 'Plan A.' For nine months, we had planned to deliver at our local birthing center. Baby+Co in Cary, NC had become our supportive family, and we were excited about the gorgeous, comfortable birthing suites and amazing team of midwives and nurses. I was looking forward to being able to control the environment (music, temperature, lighting, food, and so on), to having a giant “regular” bed where Chad could join me, to walking around the room unobstructed by monitors and IVs, to birthing in the huge tub, to minimal interruptions, and—quite honestly—a more budget-friendly birth experience. Everything had been going perfectly. My pregnancy was super smooth and easy, I had remained very active and had been eating very clean and healthy. All of my check-ups had been routine and “normal.” On the evening of April 24th, after I finally had some recognizable contractions that we could time, we were thrilled! It was still six days before our due date, but I had been enduring the discomfort of wearing adult diapers for more than a day due to a very slow leak of my waters. Although I had no pain and contractions were a good bit apart yet, Chad and I decided to head over to the birth center just in case. I was laughing, telling stories, and walking in on my own power with Chad at about 8:30pm. Jualeah, our rockstar midwife checked me right away. Vitals for both me and baby looked and sounded perfect and we were flabbergasted to learn that I was already over 9cm dilated at that point! Woohoo! We would be meeting our baby boy or baby girl much sooner than expected! Unfortunately, this is also the point we were informed that since my waters had been ruptured for more than 24 hours, I was to be automatically transferred across the street to deliver at WakeMed Cary Hospital, due to policy. Jualeah tried pulling some strings for me, due to our positive situation and even joked that if I had to “use the bathroom” before I left, she would be happy to catch the baby for me there! But otherwise….Plan A was not an option. Waaaaaaaaait, whattttt???? No, no, no, no, noooooooo. This can’t be—it’s not the plan! We’re not doing that! Ok, ok, I know you’re warned that your birth plans will likely never pan out how you plan them and that you should be prepared to change things on the fly. Of course! …For emergencies, I was fully prepared for Plan B, Plan C, or Plan Brand New, but not for this. We hugged Jualeah, I paused for one more calm contraction, and we drove to the hospital with Courtney (our photographer) and Jualeah in the car. (Jualeah came because she wanted to and because she is incredibly compassionate, caring and amazing. She stayed to help us check in, braid my hair, keep me calm, and time my contractions for as long as she could). The first few images at the hospital you’ll see below show pain on my face, but I assure you, it wasn’t birth-pain related (which I still hadn’t been feeling anyway). The painful expressions were outward proof that I was mentally and emotionally shutting down out of frustration, disappointment and disbelief. My suddenly stressed and tense body had halted the entire birthing process as a whirlwind of strangers took over my situation and wheeled me into a tiny, stark room and hooked me up to all kinds of machines in an upright hospital bed with room for one. I was terrified that I’d be forced to toss my preparations for a romantic, peaceful and natural childbirth out the institutional window. Thankfully, the medical team I was transferred to was quite good when I think back, but again, not what I had been hoping for. They accommodated our wishes to the best of their ability and we eventually did make the most of it. Really, we were all healthy and were in able hands, so I apologize for sounding dramatic or whiney. Anyway, it took Chad (and Jualeah and Courtney at times!) about three hours to talk me down off the proverbial ledge, and calm me enough to dilate that last centimeter I needed. I don’t know how I would have handled that entire situation (or that frigid, uncomfortable hospital room!) without Chad speaking encouragement, life and love into my ears. He kept me focused in my “zone” while taking care of any logistics that came up. He kissed me so sweetly throughout the whole process like we were the only two in the room. I found myself strangely enjoying each contraction that moved the baby down. After a very intense labor transition phase and about one hour of pushing, we met our natural-born baby at 1:40am on April 25th, 2016. I felt accomplished (so powerful! ), overwhelmed with love (mama bear instincts are no joke! ), overjoyed (praise Jesus for oxytocin! ), exhausted (even my neck muscles and throat were sore! ), and SO ready to go home as a family of three. Elias began nursing like a champ (and continued to do, seemingly non-stop for 14 months). And now, in 42 days, that little newborn will be two years old. How is that possible?!? I’m definitely ready for the next one! …At the birthing center, Lord willing, but now I know birth is beautiful no matter what, no matter where, and no matter who is surrounding it. Bringing life into this world is beautiful, period.